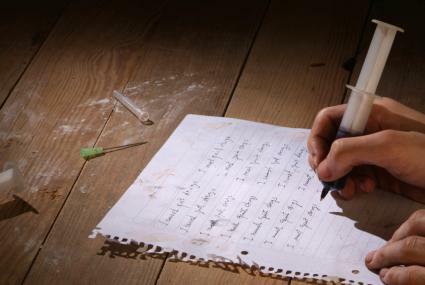 7 Reasons Why Writing is My Drug of Choice! There is a long-standing history, or tradition, possibly even an expectation, of drug use among artists. Mind-altering substances, and their use by artists in the creative process, are tolerated, sometimes celebrated, by the people who enjoy the art, and by the artists themselves. I'm no less guilty of either side of that equation than the rest of the world. I have at times guiltily reveled in stories of the excesses of Ernest Hemingway or Dylan Thomas or Willie Nelson or Jackson Pollock. Not counting myself among those just mentioned, but when I 'art' I am often guilty of overindulging in the use of large amounts of caffeine ... on occasion tempered with bourbon. My experience is that the caffeine supports some level of dissociation, allowing me to access another part of my brain (open one of the ordinarily locked doors, if you will), and to let loose the dogs of writing. Coffee is a habit, a part of the pattern, of my writing process now; ingrained and entrained through repetition, reinforced by success, in much the same way as the music that I listen to while writing. Habits initially picked up in the hopes of finding the key to unlock whatever needed unlocking in my head that would allow me to find the place, that space where writing happens. I found it, unlocked it. I have opened the door and wandered around my internal rooms of writing enough that I don't really need the drug and music (cue memories of "Dune" and Semuta) to access the place where writing comes from. But I still like setting the stage, the patterns of consumption and dissociation and behavior, the foreplay (if you'll allow) that helps my writing happen ... enough, on to the meat of what I wanted to talk about in this blog. "Space Cowboys" wasn't a great movie by anybody's definition, but there's a few cute chunks in it; one such chunk floated to the surface of my consciousness earlier this week when I was thinking about writing and drugs, and eventually,writing as a drug. This is what a plane's supposed to be. This is ugly on the ground, leaks like a sieve, but up around Mach one the seals all expand, she dries up, flies like a bat out of hell. I took her right to the limit.128,000 feet. She's only happy going fast. It's not meant to sit. My realization wasn't about drugs and writing, but that, for me, writing has become the drug, the thing that changes me ... the thing I need. Since I began writing, first the novels, but then shorter works and poems as well, my brain , my world, has been changed by the writing; it's a powerful drug and, as with the character in the marginal movie above, it's changed me, and shown me who I really am ... who, and what, I can actually be. My mind is different since I began to write; the creation and sharing of stories begets more creation and more stories. I love imagining problems and their solutions. Helping other people find the keys to unlocking their storytellers brings me real joy. The world is a different place now, my interactions with humanity have changed, and I'm less of an island than I once was. My days are fat and happy puppies, with more stories to tell than I have time for, I get to pick and choose. I can imagine the world, and my life beyond, after, what I'm doing now, and the thought makes me happy ... even eager. The person I'm becoming is the kind of guy I'd like to hang out with, and such has not always been the case. Writing is my SR-71, for those who need a lighted walkway through my dark and cluttered meanderings. It's who, and what, maybe even why, I am. I was smart enough and kind enough and strong enough to make it in this world for the first forty-some years of my life, but finding writing allowed me to 'level up', and do everything I do just a bit better (or at least a bit happier).